Mill End Voices is a monthly adult mixed choir. No membership or previous experience is necessary, although an ability to read music would be an advantage in our sometimes fast-paced rehearsals. Just turn up and pay £10 on the door. Newcomers are always welcome at any time of the year and will enjoy their first session at the discounted price of just £5. The choir is a not-for-profit organisation which raises money for the High Wycombe Music Centre PTA. 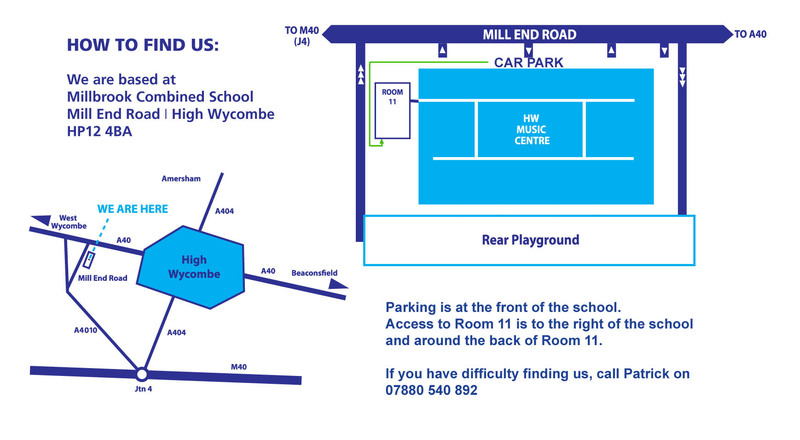 We aim to rehearse on the 2nd Sunday of every month (half terms and school holidays permitting; see our calendar for dates) at the High Wycombe Music Centre in Room 11 (click for parking information or directions to Room 11). The choir is directed by Patrick Gazard and many of our arrangements are written by Patrick, as well as our Chair, Simon Harrison, with an emphasis on film and musical theatre songs, but also covering light classical and pop music. Our next rehearsal is this coming Sunday, 28th April from 14:30 to 17:00. On Sunday 1st July 2018, Mill End Voices performed in a spectacular event at The Royal Albert Hall, as part of Buckinghamshire Music Trust’s Celebration Concert. Singing two well-loved songs, This is Me from the Greatest Showman and Big Apple Mack, a mash-up of two fabulous swing numbers, choir members were “delighted” and “excited” by performing in such a stunning auditorium where the world’s stars have performed. The evening culminated in a massed finale involving hundreds of performers of all ages.